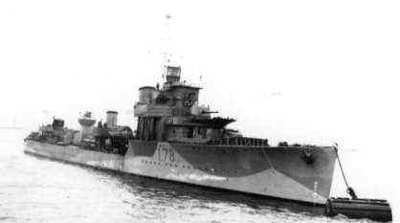 HMS Wolverine (Lt.Cdr. J.M. Rowland, RN) attacked the German submarine U-A with depth charges south off Iceland. This attack is often credited to have resulted in the loss of the famous U-47 but this is not true. The British merchant Empire Whimbrel is torpedoed and sunk by the German submarine U-181 about 420 nautical miles south-west of Freetown in position 02º31'N, 15º55'W. The British destroyers HMS Wolverine (Lt. T.K. Edge-Partington, RN) and HMS Witch (Lt.Cdr. S.R.J. Woods, RNR) later pick up 53 survivors. The British merchant Empire Kohinoor is torpedoed and sunk by the German submarine U-618 about 250 nautical miles south-west of Freetown in position 06º20'N, 16º30'W. HMS Wolverine (Cdr. J.M. Money, RN) later picks up survivors.